It’s been an interesting quarter in global markets, with the S&P 500 up over 8% since the turn of the year. US stocks mirrored stronger moves in Chinese and Brazilian stocks through January. 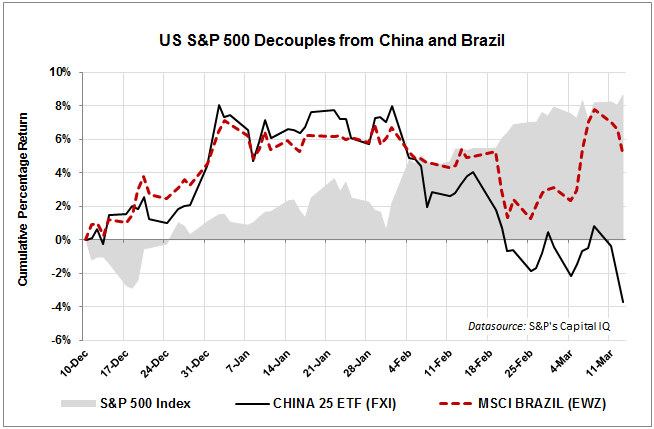 Since that time, China has steadily faltered, with Brazil following over the last week. US stocks have continued logging their 0.25% daily gain, however — at least for now. If the world’s growth engines are signaling “time out,” how much longer before US stocks re-couple with the global trend and we get that long-expected correction? If a downward move starts, be nimble, and don’t expect a full -10% as in markets of yore. After a few percent to the downside, expect money to pour in from the sidelines as conscientious objectors try to make up for missing the turn-of-the-year rally. information in such an ideal approach of writing? I’ve a presentation next week, and I am on the look for such information.